First Minister Nicola Sturgeon and Abir Mukherjee at The Music Hall on the opening night of Granite Noir. But last night the first minister turned interviewer for the opening night of Granite Noir, the north-east’s annual celebration of crime fiction. 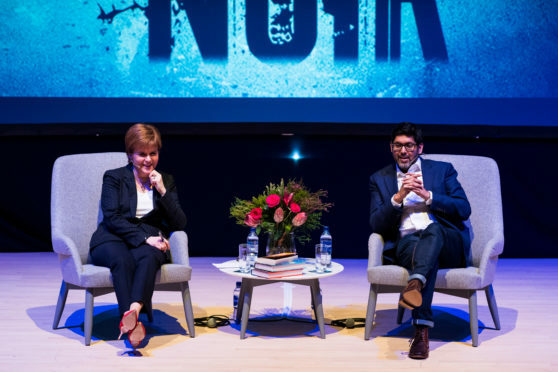 A self-confessed fan of the grisliest elements of fiction, Nicola Sturgeon was the guest host of the first night and welcomed second-generation Indian immigrant Abir Mukherjee to discuss the shared heritage of Scotland and Bengal at the Music Hall. Mukherjee, the best-selling Scottish author of the Sam Wyndham novels, is among a growing number of British-Asian crime fiction novelists whose books are finding favour with one of literature’s most fervent fanbases – including the first minister. The pair discussed a range of topics including Mukherjee’s work, other authors, Brexit, Scottish Independence and even Ms Sturgeon’s own literary aspirations. Before introducing her guest, the first minister thanked the audience for attending and also praised her newly-refurbished surroundings. She said: “It is an absolute thrill for me to be here at Granite Noir. “It’s the very first time I’ve been here and coming to a book festival is always a wonderful experience. Mukherjee’s novels follow an English detective and his Bengali sidekick in Calcutta in the inter-war years. The setting of the novel got the pair onto the subject of history, and how much of the reality of events can be lost with the passing of time. In particular, the recent row surrounding the legacy of Winston Churchill was touched on. Ms Sturgeon said that “we seem to have lost the ability to have that nuanced debate”. But the subject matter was not all serious and there were laughs from the audience when the first minister asked what subjects of today Mukherjee might turn his pen to in the future, including Brexit and independence. Mukherjee said: “It’s very difficult to fictionalise Brexit to make it anymore of a rollercoaster. “Watch this space,” responded Ms Sturgeon. The audience even got an insight into whether the first minister might turn her hand to writing should she ever choose to leave politics. “The main problem I would have is making the plot all connect together – I could come up with plenty of people to murder,” she joked. The pair then took questions from the audience, including choosing which crime fiction author should be on the English literature syllabus at Aberdeen University. Among the writers the first minister picked were Stuart Macbride, who is appearing at the same venue later tonight, and the late William McIlvanney. Ms Sturgeon revealed it was one of her “biggest regrets” that she was never taught by the legendary author, who was an English teacher at Greenwood Academy in Dreghorn but left a year before she started the secondary. Granite Noir runs until Sunday.